1.42mm wire springs, 60mm in diameter, sewn in individual calico pockets and hand-formed into a honeycomb-nested unit. Constructed with two layers of springs. 23cm deep with three rows of genuine hand side-stitching. Eight horizontal handles on King Size and above. Air vents on all sides. Border edges upholstered with coir and wool, finished with piped ticking. Upholstered with 1,000gsm bonded British fleece wool and cotton, then 1,200gsm hand-teased long-stranded horsetail blended with real Shetland Isle fleece wool, enclosed in a hair-proof cambric cover and overlaid with a layer of 1,200gsm blended real Shetland Isle fleece wool and cotton. 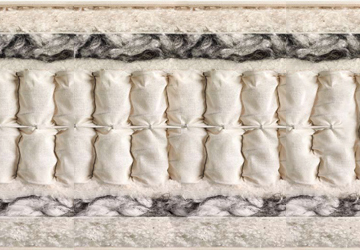 The Tiara mattress features two layers of superbly responsive Vispring nested springs.